Your mobile is no doubt your main communication tool, so that means all of the interaction you’ve had with your loved ones is on your phone. Text messages from friends and family are most likely very important to you and you don’t want them disappear. You’ve probably asked yourself: “Is there an app to save text messages to iPhone?” or “Is there an app to download text messages from my iPhone?”. The answer differs. Due to Apple’s restrictions, there currently isn’t a mobile app that downloads or saves text messages on your iPhone. However, there are some desktop apps available to save all of those precious conversations. Here’s some information to help you save text messages from iPhone. If the thought of losing your text messages keeps you up at night, there’s no need to stress any longer. iMyFone D-Back with the latest technology will allow you to not only save text messages but also back up your lost text messages. The iMyFone D-Back allows you to save lost and existing data on your iPhone using a few easy-to-follow steps. It’s compatible with all iOS versions and devices, including iOS 12 and iPhone XS (Max). So here how you can save text messages from iPhone directly. 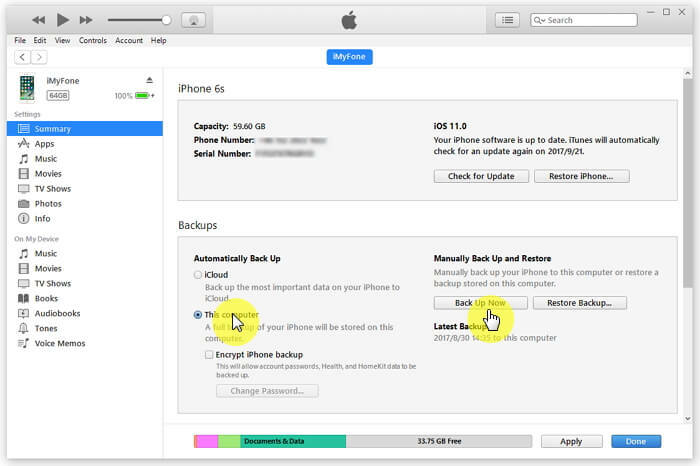 Launch iMyFone D-Back, click on the “Recover from iOS Device” tab, then click on "Start". Connect your device to computer and the program will detect it. Once it does, click "Next" to proceed. Select the types of files that you would like recover, like text messages, and then click "Scan". 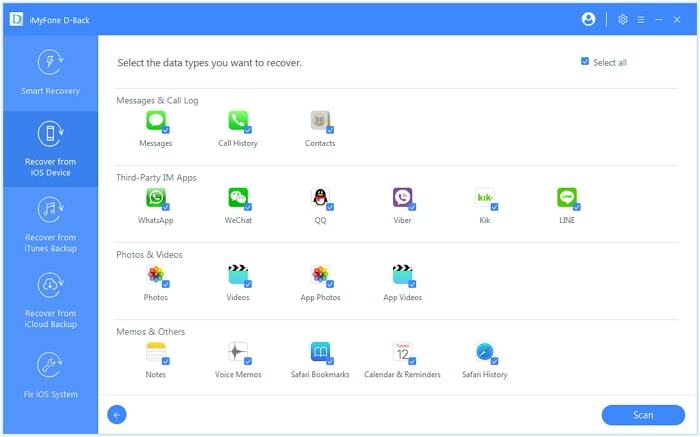 The program will start looking for the existing and deleted sms from your device. 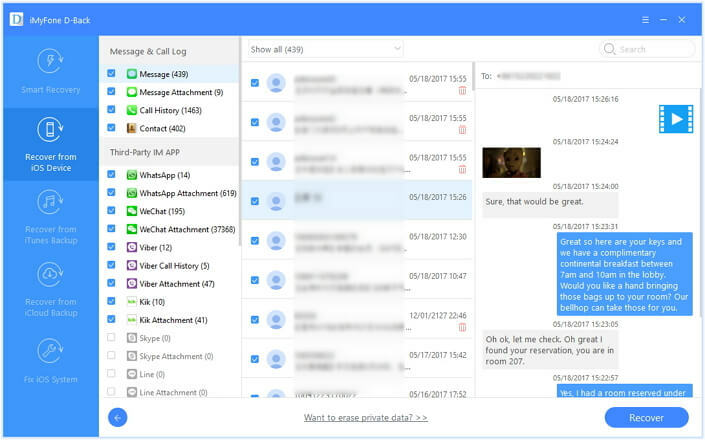 After the scan is completed, all recoverable messages will be organized into categories. So, click on each tab to check all the files. If you only want to preview the deleted items then choose "Show only the deleted files". Select the files that you want to recover, and then click "Recover" at the bottom right corner. You can also use this way to download messages from iTunes/iCloud backups without restoring the whole backup, which is a huge bonus. There are alternative ways to save or backup your text messages, which don’t require a third-party tool, and don’t cost a thing. Here’s how to save text messages from iCloud and iTunes. The iCloud is a magical thing, and a great way to securely store your data. If you’re not keen on using a third-party app to save text messages, then you can make use of iCloud to save them. The upside of this method is that every iOS user gets a standard 5 GB of free storage on iCloud which can be increased if you purchase more space. The downside is that if you need to restore your data, you must reset your device first. That is to say, all your current data will be replaced by the backup. Step 1. 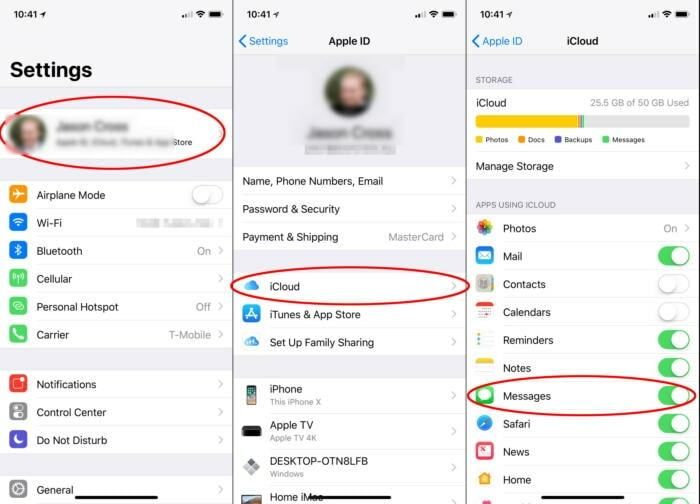 On your device, go to Settings > [your name], and tap iCloud.. Step 2. Tap iCloud Backup. Step 3. Choose Back Up Now to complete the process. Another alternative is to save text messages on your iPhone using iTunes. Once again, this method doesn’t cost anything but you’ll need a laptop or computer to complete the process. Ensure that you have the latest version of iTunes, so you need update it in advance. Step 1. Open iTunes and connect your device to computer. Step 2. A message may ask for your device passcode or for you to “Trust This Computer”, then follow the on-screen steps. Step 3. 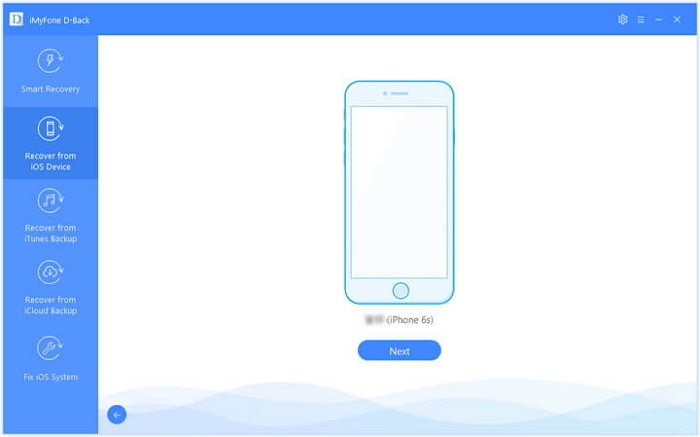 Select your iPhone when it appears in iTunes. Then click Back Up Now. Step 4. When it’s finished, you can check if the backup finished successfully on the “Summary screen” in iTunes and you’ll find the date and time in the “Latest Backup”. There are obviously pros and cons to use each method. iMyFone D-Back allows you to selectively save both lost and existing text messages and helps to extract and save messages from iTunes/iCloud without restoring the whole backup. If you use the iCloud method, you just have 5 GB free storage to save data. What’s worse, in order to restore your data, you will lose all current data. Using iTunes is free but you cannot only choose text messages data type to save. iMyFone D-Back is also trusted by many professional websites. Here luckily, there are a variety of options you can take to save your data. The above information should help you determine which method is best for you. Feel free to leave comments below about these methods or this topic.